This project examined the relationship between data-driven policing initiatives and the ability of the police to deliver public value. By data driven policing, we mean the current use of a wide variety of digitised data sources to inform decision making, improve processes, and increase actionable intelligence for all personnel within a police service, whether they be operating at the front-line or in positions of strategic leadership. 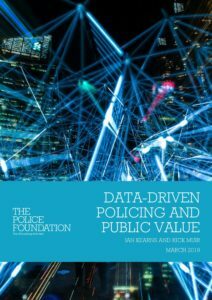 By public value, we mean the full value that a police force contributes to society across a number of measurable dimensions, including outcomes (eg crime rates and crime detection rates in a given area); efficiency gains (for example cost savings, better management of demand, improved productivity); impact on citizen satisfaction with the police (eg in survey data); and impact on public trust in, and perceived legitimacy of, the police. In bringing data driven policing and public value together in this way, the project aimed to generate new insights into what data driven policing initiatives are being tried in the UK and around the world; who seems to be getting it right and having an impact on the indicators that matter most to police forces and their political masters; and what lessons might be learned and best practices adopted by others as a result of those findings. Dr Ian Kearns is a senior associate fellow of the Police Foundation. He has 25 years of experience working in the public, private and NGO sectors. He is a former Deputy Director and Acting Director of the Institute for Public Policy Research (IPPR). Prior to this Ian was a Director of the Global Government Industry Practice of Electronic Data Systems (EDS) and a co-founder of the European Leadership Network.